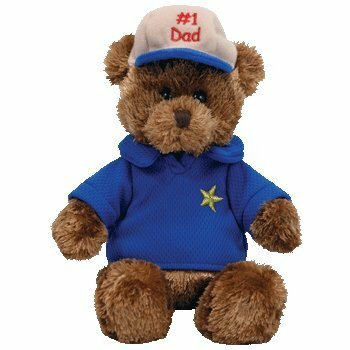 Dear Dad is made from a fuzzy brown material with brown and black button eyes and an embroidered brown nose. He wears a white and blue baseball cap with “#1 Dad” embroidered in red thread. He also wears a blue t-shirt with a small embroidered gold star in the front. I love you and you’re my Dear Dad! Dear Dad was released on 30th March 2007. His birthday is on 23rd June 2006. He is a Father’s Day Beanie Baby bear. He retired on 6th April 2010.